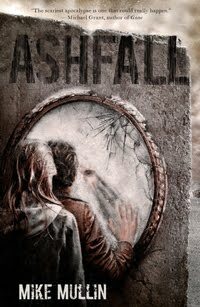 I love stories that revolve around natural disasters, so when I saw that Ashfall was available on NetGalley, I had to request a copy! Ashfall is the story of what happens to a teenage boy living in Iowa--Alex--when the supervolcano in Yellowstone National Park erupts and turns his state into a disaster zone. The action starts immediately when a flaming rock from the volcano crashes into Alex's house, and it continues non-stop! One thing that really stood out to me in this book was how well-researched it was. I could tell that Mike Mullin paid careful attention to the details (even when the details were gory) and that's important when writing about a volcanic disaster like the one that happens in Ashfall. Everything was researched and explained in a way that was clear to the reader -- one part that really stood out to me was when Darla had to butcher a rabbit and prepare it to eat. It was a very detailed (and not gonna lie, kind of gross), description, and reading those details made it apparent how much Alex's life had changed from when he could just go to the store and pick up pre-packaged sandwich meat. Speaking of Darla, she was an awesome character, and I love how she and Alex brought out the best in each other. Darla was tough and resourceful, and Alex was a little more sympathetic to others (and also resourceful, but Darla was the mechanic of the two of them). His taekwondo skills were also quite helpful on their journey! Speaking of his journey, I liked how he not only completed a physical journey, but an emotional one as well. He changed so much through the novel, going from a boy who liked to play video games, complained a lot, and fought with his mom, to someone who was stubborn, strong, and stuck through the toughest of situations. If you like natural disaster books, this is definitely one I recommend picking up. I also loved how in the authors notes, Mike Mullin talked about the facts behind the supervolcano. Very interesting to read! Great review, Michelle. I'm glad Alex's inner journey came through for you. I felt like that was very important--it's the part we can all relate to, even if (thankfully) we don't have to face the tests Alex confronts.